The Mediator is a PCI implementation for connecting PCI devices in Amiga computers, allowing expansion of Amiga with all kinds of industry standard hardware products like graphic, sound, network, USB, TV tuner, ISDN and MPEG-2 hardware decoder PCI cards. Moreover, the Mediator PCI busboard is ready for SharkPPC PCI cards based on the latest PowerPC G3 and G4 processors. The minimum hardware configuration is: Amiga 1200 in tower case with a 4MB RAM expansion card. The recommended configuration is: Amiga 1200 in Winner/Power/E-BOX tower case, any 68060 (or PPC with 68060) turbo card with 64MB RAM, a SharkPPC G3/G4 card with 128MB SDRAM, a Voodoo3 graphic card. For simultaneous use of up to four PCI cards fully assimilated in the Amiga environment. With the PCI clock running at 33MHz, data transfers are executed with the bandwidth of up to 132MB/s and up to 264MB/s for 66MHz clocking. Longword transfers are supported in all data transfer types: PCI to Amiga, Amiga to PCI and PCI to PCI. Mediator PCI 1200 allows access to the entire 4GB of the PCI memory space. Access to the entire PCI memory space is executed through the 8MB window in the A1200 memory space. With a hardware-supported paging mechanism, PCI memory access is executed without any slowdown compared to the linear memory access. Mediator PCI supports the busmastering mechanism in all its PCI slots. The PCI cards in the busmaster mode can offer extremely fast DMA access (up to 132MB/s) without any CPU load. Up to four PCI busmaster cards may be used simultaneously in Mediator. 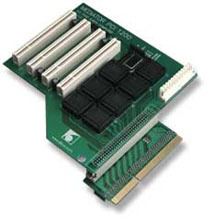 Mediator PCI 1200 uses part of the graphic card memory for Amiga system needs. Thus, the entire system gains in effectiveness as graphic card's SDRAM/SGRAM memory modules are about 10x faster than FastRAM memory in Amiga turbo cards. With very short access time in SDRAM/SGRAM, several PCI busmaster cards may use this memory simultaneously. The PCI cards may then rush at the data transfer rate of up to 132MB/s without any CPU load whatsoever. Address and data parity are supported in all Mediator slots. Parity support is necessary for using PCI cards like Sound Blaster Audigy, Sound Blaster Live! or ForteMedia FM801-based PCI cards. The Mediator Interrupt Controller manages four independent PCI interrupt lines. Mediator PCI 1200 is compatible with all the major A1200 turbo card models. Mediator PCI 1200 is designed for the following turbo cards: Blizzard PPC/060, Blizzard PPC/040, Blizzard 1260, Apollo 1260, Blizzard 1240, Apollo 1240, Blizzard 1230 (III, IV), Apollo 1230, GVP 1230, Elbox 1230 and M-Tec 1230. Mediator PCI 1200 and PCI cards in its slots fit perfectly in the following tower systems: Winner Tower, V-Tower, Power Tower, E/BOX 1200, Infinitiv Tower, EZ Tower. Mediator PCI 1200 can be also installed in other Amiga towers though this may require some physical modifications of these. The Mediator PCI 1200 is available with a standard software pack: 2D and Warp3D Voodoo3 graphic drivers, Voodoo4 and Voodoo5 24-bit 2D graphic drivers, S3 ViRGE and S3 ViRGE DX 2D graphic drivers and Ethernet 10Mbps network drivers. Mediator PCI 1200 can also be obtained with an extended software pack including the Mediator Multimedia CD.